Are you interested in learning more about Facebook for your business? 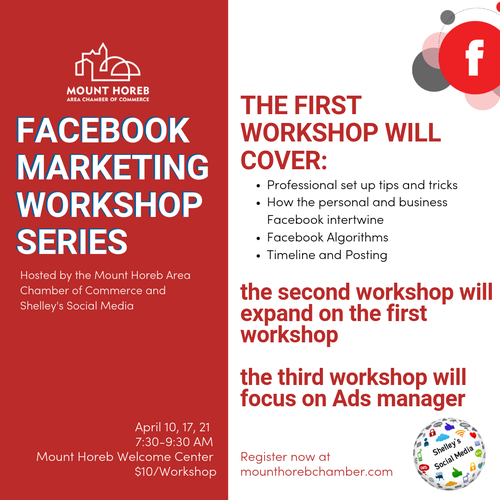 The Mount Horeb Area Chamber of Commerce is partnering with Shelley's Social Media to bring you a three-part workshop series focused on Facebook marketing! The third will cover Marketing on Facebook including the Facebook Ad Manager. The workshops will run from 7:30-9:00 am on April 10, 17, and 24 in the upstairs of the Mount Horeb State Bank of Cross Plains. Cost of attendance is $10/workshop for chamber members and $20/workshop for non-chamber members. This workshop series will take place in the upstairs of the State Bank of Cross Plains (Mount Horeb branch).